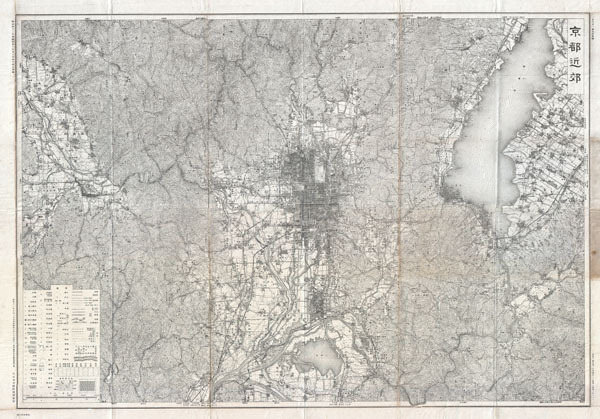 This is a large and spectacular 1936 or Showa 11 topographical plan or map of Kyoto, Japan. Details all of Kyoto as well as its suburban precincts on a scale of 1:50,000. Features more than 50 legend items noting post offices, banks, churches, consulates, army stations, government offices, schools, hospitals, fields, orchards, cemeteries, telegraph offices, weather centers, shrines, jails, and police stations. Prepared based upon an early Meiji 42 survey by the Imperial Japanese Army. All text is in Japanese. Very good. Original folds exhibit some wear and verso repairs, especially at fold intersections.